I offer sightseeing tour around North Sulawesi for visitors who are interested in seeing beautiful forest, farmland and mountains of the region. The tour will be started in Manado city - the capital of North Sulawesi. I will meet you at the airport or at the hotel where you stay and then organize your tour around the province. We will start by visiting Kotamobagu regency. Our first stop will be a pond at the roadside where you will be able to watch birds such as Collared Kingfisher, Sunda Teal, Little Egret, Black-wing Stilt, Javan Pond Heron. Visitors need to bring their binoculars. A spotting scope on a stable tripod will greatly enhance your birding experience. After spending twenty minutes to half an hour at the road side pond, we will continue our trip to Tante Mien homestay. We will unload our bags and take a rest for a while. When we have restored our energy, we could start our tour to see the farmland and villages of Kotamobagu. The next morning, we will go to a Maleo sanctuary. 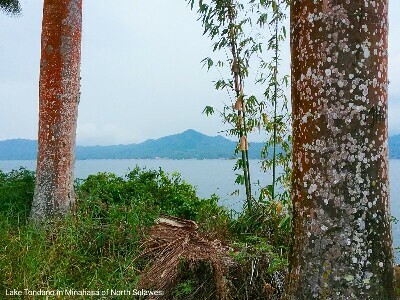 There, we will watch Maleo birds and other beautiful birds of Kotamobagu such as Purple-winged Roller, Yellow-billed Malkoha, Sulawesi Pygmy Woodpecker, as well as Pale Blue Monarch, and Maroon-chinned Fruit Dove. We will spend several days here to explore its forest, and villages. Our destination will be to Minahasa regency. We will stop for a while to see the beautiful farmland below Mount Ambang and go hiking to find Matinan Flycatcher, Citrine Canary Flycatcher, and butterflies in the forest. 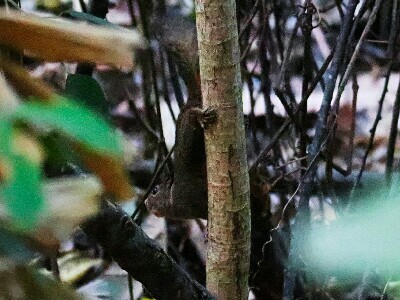 In the morning time, squirrels are also active. They climb trees, hopping from one branch to another to find fruits. After lunch, we will continue our land tour by car, passing through Amurang and then going up slopes of Minahasa highland to Sonder. A long the way, we will be able to watch waterfalls in Timbukar. In Tincep, we can stop for a while to see terraces of rice field. Farmers in Sonder have fish and pig farms along the banks of the river. We can stop for a while to watch cattle egret, or sooty headed bulbul and olive backed sunbird in the farmland area before continuing our trip to Tomohon. We will spend several days in Minahasa to go hiking in Mahawu volcano, visit Lake Linow and Lake Tondano as well as seeing traditional Minahasan wooden house industry and furniture industry in Woloan and Leilem. For those who are interested in Minahasan food, they can try Tinutuan, and spicy grilled pork or grilled mujair fish. Our activities will be a combination of nature watching tour to find Scaly-breasted Kingfisher, and Sulawesi Scops Owl to sightseeing in Minahasan farmlands and village areas. Trips to see producers of earthenware products in Polutan village can also be organized. Please, contact me by email to: leororing@gmail.com or by whatsapp to: +6281332245180.